From the resort of Binz, on the coast of Rügen island, the path into the Granitz forest starts at the point where the promenade runs out, the neat paving stones giving way to a sandy track of dirt that skirts the beach until it plunges inland and up towards the high cliff-top trail. Germany’s Baltic coast can in general be pretty flat – a landscape of big skies, dykes and dunes, where the only things reaching up towards the clouds are electricity pylons or windfarms. But Granitz is a bit different, formed as it was during the ice age; an undulating moraine landscape that marks the furthest extent of a glaciers journey, like rubble pushed across a wasteland by a mechanical digger. This entry was posted in Diary, Gallery, Places, Running on February 9, 2016 by Paul Scraton. It was in these quiet days between Christmas and New Year in 2011 that I started Under a Grey Sky, so as well as a look back on what has been going on over the past twelve months it is also something of a birthday. Although I haven’t been able to keep up the intensity of posting here over the last year or so, I remain very proud of the writing that I have published here in 2015 and remain incredibly pleased that so many people continue to read about my (and our) adventures beyond the front door. At this point a year ago I had a couple of plans for the 2015. I had just finished work at The Circus after five years looking after their company communications and a decision to return to the world of freelance work. The first major plan was the launch of Elsewhere: A Journal of Place with my friend Julia. We published Elsewhere No.01 in June, followed by Elsewhere No.02 in September. Along the way we built a small team here in Berlin who helped us get the journal out there and put on a couple of events, as well as working with some excellent writers, photographers, musicians and illustrators from around the world. I am incredibly proud of Elsewhere and can’t wait to show everyone No’s 3 and 4 which will be published in 2016. This entry was posted in Diary, Journey, Memory, Places, Reflections, Running, Walks on December 29, 2015 by Paul Scraton. It is strange to visit a place that has already appeared on your own website to which you have never seen with your own eyes before. 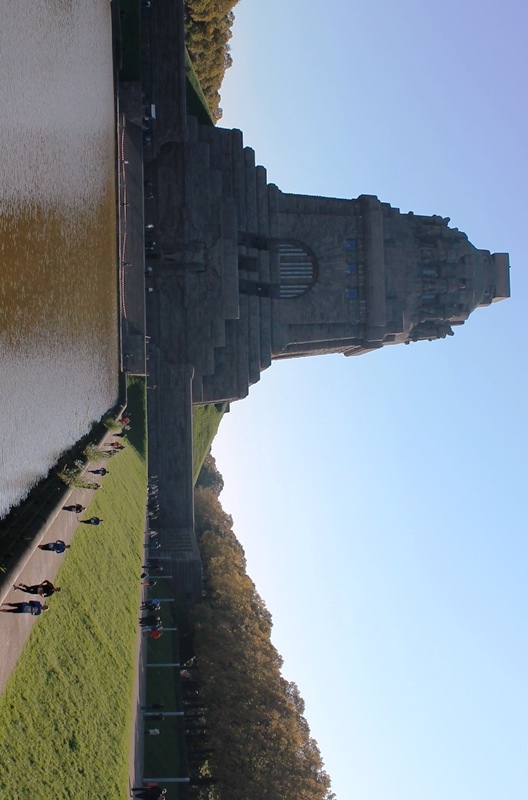 Katrin visited Leipzig’s Monument to the Battle of the Nations (Völkerschlachtdenkmal in German) a couple of years ago and wrote this post for Under a Grey Sky. But even her pictures could not do justice to the looming scale of the thing, as we arrived to face it on Saturday afternoon as I registered for the Leipzig Half Marathon that was taking place the following morning. This entry was posted in Diary, Places, Running on October 14, 2015 by Paul Scraton.